January saw the first AIDA Instructors course in Israel (Eilat, Red Sea). There were two people attending – Alon Rivkind and Shlomi Goldstein, we would like to welcome them as new instructors in AIDA, congratulations Shlomi and Alon. Alon and Shlomi were both competition freedivers and both had had some previous experience in teaching, their reasons for joining AIDA were much the same as my own, in freediving today anyone can call himself an instructor and teach freediving, apart from the fact that many self appointed instructors and even some who have appointed themselves Instructor Trainers (Instructor of Instructors) have in fact very little knowledge of freediving. 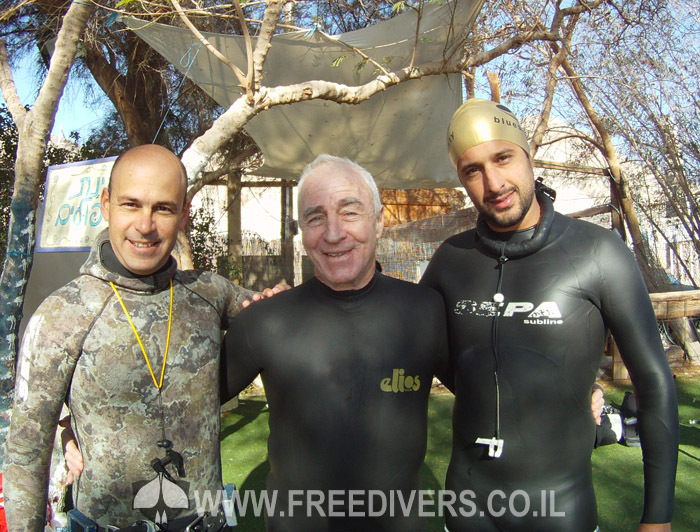 There is a kind of Wild West of freediving in Israel at the moment and the student having no standard of comparison believes implicitly in his own instructor. We wanted to create a cadre of instructors in Israel that would have an internationally guaranteed standard, an elite in freediving instruction. The problem with a 1 man show, an instructor who has invented himself is two fold, when he decides to stop teaching his certificate is worthless, and secondly the insurance agencies do not easily accept them particularly if you aspire to teach. And AIDA may not recognise them as a prerequesite for more advanced training. 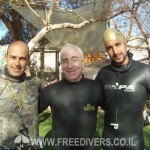 I met Alon first in 2008 when I visited Israel from Mexico, and in 2010 he attended all 4 seminars I gave on deeper freediving for divers already doing more than 40mts. I was very impressed with his potential and we discussed the problem that in Israel a deep diver was a 40mt diver. At this stage a diver that had ambitions in Israel for competition was limited to 40mts, the deepest one could tie off a buoy, or go down to Dahab. Which for some was impossible. My opinion was that until we invested in a boat and counter weight system we would be extremely limited. Alon did both and the results speak for themselves!! I met Shlomi last year and helped prepare him for his first major competition in Greece, and again I was impressed with his potential. I am sure that Alon and Shlomi will both be a valuable addition to AIDA education in Israel. Well done guys! Jacob first came to do a course with me in Mexico 2 years ago. Jacob is the skipper of a very large private yacht, he was a surfer and a good swimmer. Jacob’s work doesn’t leave him much time for freediving, but he tries every year to spend 1 month at his favourite sport. Jacob has passed 43mts in his chosen discipline of CNF, he wants to do 50mts, his challenge is in improving his mouthfill. We agreed the best way to improve his equalisation was by doing totally empty lung descents, not to be confused with FRC which is diving after a passive exhale. Here Jacob is pulling down to 10mts, totally empty. This physiologically and from an equalisation point of view is exactly equivalent to a 60mt dive . He goes slowly because all the physiological changes take place in a very short period of time. After each dive we discuss his sensations, what stopped him and what happened to the air in his cheeks. Notice he is not wearing any weights when doing empty lung exercises this is both unnecessary and also an important safety precaution while doing empty lungs. He finishes the session by doing a full lung dive to the bottom by the satil ( missile boat ) for fun and light relief.